A few days ago, I set about tidying up my completely unruly Contacts database. Over the years I have accumulated 2,953 distinct contact cards. Thousands are duplicates, hundreds were added automatically by Mail or macOS, some are for people whom I no longer know, and a very few are for folks I no longer want to know. The first thing to do was obviously to take care of those duplicates. Contacts on the Mac features a couple seemingly handy menu items for dealing with this problem: “Look for Duplicates” and “Merge Selected Cards.” I cannot recommend using either of these features. Seeing that I would have to identify the clones myself, I committed to selecting groups of two or three clearly duplicated identities, and selecting Card -> Merge Selected Cards. I generally trust Apple software to do the right thing, but recognizing the heartache that would come with losing any information from these cards, I decided to proactively export my Contacts database so that I would be safe should anything go wrong. Selecting File -> Export… -> Contacts Archive from the menu bar produced a 60MB bundle that seemed certain to contain all of the contact information on my Mac. I tried “Merge Selected Cards” on a few items, and it seemed to do the trick. Where data from the two cards was identical, it merged them cleanly. Where something was in conflict, for example if a Company Name had changed from “Google” to “Apple” at some point, the conflict was resolved by picking one and appending the other to the merged card’s “Note”. I double-clicked the backup file in the Finder, and agreed when Contacts asked if I was sure I wanted to “replace my Contacts data” with the contents of the archive. You’re damned right, I am sure! Give me back my data. After restoring from Backup, I found that I didn’t have any duplicate entries in Contacts. In fact, I only had around 130 cards. Somehow I had lost the vast majority of cards in this process. What’s going on here? I think what happened is that exporting from Contacts on my Mac is creating an archive that, when imported, possibly reflects the state of my Contacts database from years ago, before I ever agreed to sync Contacts with iCloud. No amount of futzing with local data on my Mac, including disabling iCloud syncing, and restoring the contents of Contacts’s data folder (~/Library/Application Support/AddressBook) would coerce Contacts into showing me all of my Contacts. I began to panic. Had I actually lost all of my Contacts data? In spite of dutifully backing up my local data and making a proactive archive from Contacts, the app had a very different idea of what my Contacts “truth” was. I was relieved to discover an iCloud.com feature for recovering Contacts to the state they were in on a previous date. 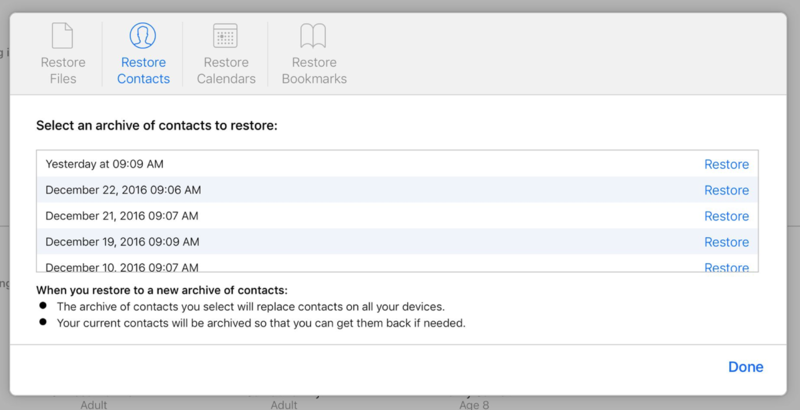 You get to it by navigating to iCloud Settings -> Advanced, and clicking the “Restore Contacts” link. After restoring Contacts through iCloud.com, and syncing to iCloud from my Mac, my Contacts were finally restored to their absurdly broken, but data-intact, state. The overarching lesson here is that when it comes to iCloud-synced data, you cannot count on local data, and worse: you can’t count on local archives. If you care to archive your data, navigate to iCloud.com and use the pertinent export feature from the web site. 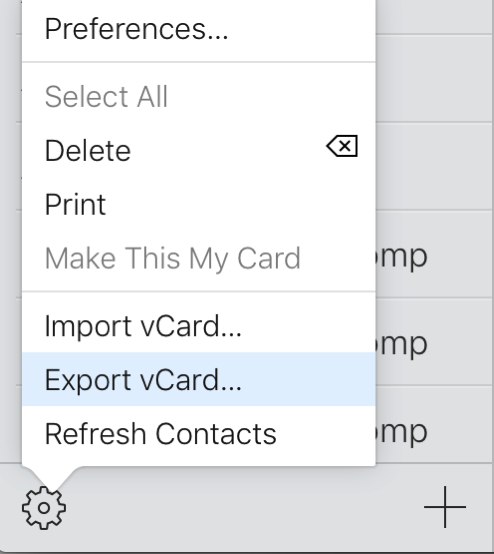 For example, from iCloud.com’s Contacts interface, click on a contact, then select “Select All”, and then “Export vCard…”. Amusingly, downloading this file will probably cause Contacts on your Mac to immediately attempt to import all of the contacts, which of course you will want to decline to do. Apple has a reference page, with detailed instructions for archiving various kinds of iCloud data. The other lesson of course is you can’t trust Contacts to do a good or even acceptable job merging Contacts. I’ll be looking for another solution on this front. On Twitter, a f waller suggested Smart Merge Pro for iOS, but I tried that and it unfortunately is also blind to the duplicate nature of my cards! I guess something special is making my cards appear non-duplicated to both Contacts and this third-party app. Update: I figured out why “Look for Duplicates” behaved so poorly: it wasn’t even considering my iCloud-based cards. So when I invoke it in Contacts on my Mac, it evaluates only the ~140 cards that are considered local to my Mac, and completely ignores the ~3000 cards that are synced via iCloud. Unfortunately there is no “Look for Duplicates” on iCloud.com, so what is a Mac-based user, for whom Smart Merge Pro doesn’t work, to do? I think the way it works is it only considered “On my Mac” cards, if there are any local cards. If all your cards are iCloud based, then the “Look for Duplicates” command seems to work as expected.